The ARCNET Interconnect (AI) Series of fixed-port hubs were created to fill the need to expand ARCNET Local Area Network (LANs) by way of repeaters, links and hubs. Repeaters can extend a network using the same cabling technology. A link can mix two cabling technologies-functioning as a media converter. A hub can add a segment and give support for distributed star topologies. The AI can implement all three of these expansion methods depending upon the number of its ports. The AI2 provides two ports for repeater and link applications while the AI3 implements the hub function. However, the AI2 and AI3 utilize the same robust hub timing electronics found in Contemporary Controls MOD HUB of modular active hubs. The AI operates from either wide-range, low-voltage AC (8-24 VAC) or DC (10-36 VDC) power. Redundant power sources can be attached for critical applications. 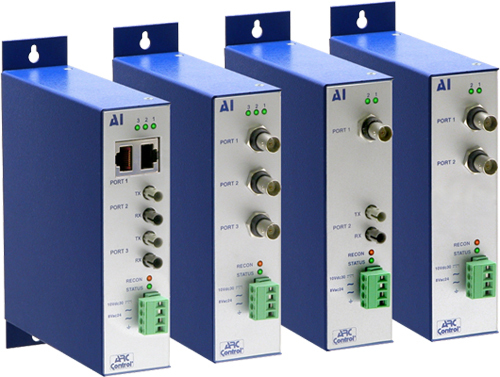 The AI Series supports variable data rates from 78 kbps to 10 Mbps to accommodate the newer ARCNET controller chips and popular EIA-485 transceivers. A watchdog timer stops hub lockup-eliminating the necessity of cycling power due to signal transmission error. Active hubs increase the robustness of ARCNET networks. They maximize the distance that can be attained on each cable segment-up to 2000 feet (610 m) on coaxial segments and 6000 feet (1825 m) on multimode fiber optic segments. They block interference to the network by squelching reflections caused by open or shorted cable segments attached to the hub. Unused hub ports need not be terminated. Active hubs allow for a distributed star topology; thereby, minimizing the cabling required in a plant. Links and repeaters provide extensions to bus systems or bridging to other cable media. Each AI port has an LED to indicate the reception of data or the passing of the token. One LED on this unit indicates that the device is operating properly while another indicates the occurrence of a network reconfiguration. AI2-485 No longer available. Use the AI3-485 shown below. AI2-485X No longer available. Use the AI3-485X shown below.